One of the simplest ways to convert words from a natural language into mathematical tensors is to simply represent them as one-hot vectors where the length of these vectors is equal to the size of the vocabulary from where these words are fetched. "a", "apple", "has", "matrix", "pineapple", "python", "the", "you"
Obviously, this approach will become a pain when we have a huge vocabulary of words (say millions), and have to train models with these representations as inputs. But apart from this issue, another problem with this approach is that there is no built-in mechanism to convey semantic similarity of words. eg. in the above example, apple and pineapple can be considered to be similar (as both are fruits), but their vector representations don't convey that. Word Embeddings let us represent words or phrases as vectors of real numbers, where these vectors actually retain the semantic relationships between the original words. Instead of representing words as one-hot vectors, word embeddings map words to a continuous vector space with a much lower dimension. This mathematical embedding is achieved by a matrix called "embedding matrix". This EM is a matrix of shape (maximum_number_of_words_to_represented,embed_size). ` is the length of the embedded vectors. Let's see how word embeddings work. 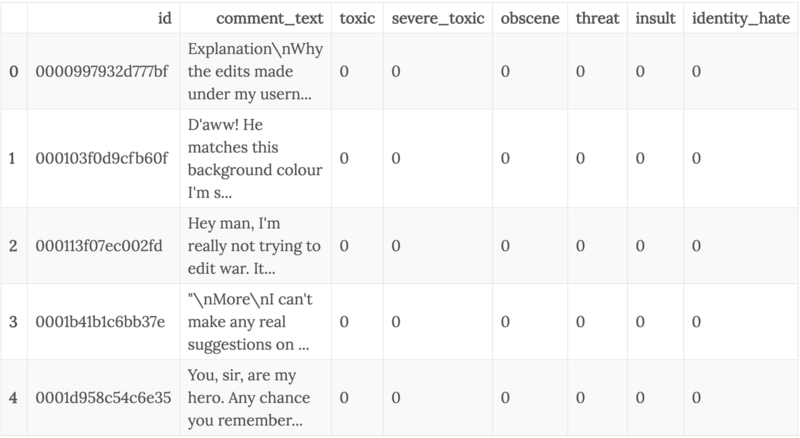 # DRIVE_BASE_PATH = "/content/gdrive/My\ Drive/Colab\ Notebooks/"
I'll make use of the data provided in this Kaggle competition where the goal is to classify comments based on how toxic they are. Let's check out some of the comments. Hey man, I'm really not trying to edit war. It's just that this guy is constantly removing relevant information and talking to me through edits instead of my talk page. He seems to care more about the formatting than the actual info. I can't make any real suggestions on improvement - I wondered if the section statistics should be later on, or a subsection of ""types of accidents""  -I think the references may need tidying so that they are all in the exact same format ie date format etc. I can do that later on, if no-one else does first - if you have any preferences for formatting style on references or want to do it yourself please let me know. There appears to be a backlog on articles for review so I guess there may be a delay until a reviewer turns up. It's listed in the relevant form eg Wikipedia:Good_article_nominations#Transport  "
You, sir, are my hero. Any chance you remember what page that's on? If you go through this data, you'll find that it contains a lot of toxic comments, and the training data is highly unbalanced. Anyways, that's not my focus for now. I just want to make use of this text data to understand (and explain) how word embeddings can help with training models on natural language data. So the word vector file is made of rows where the first element is the word, and the next embed_size numbers are it's vector representation. I'm using the 50-dimensional-vectors version of glove in this case. Next step is to generate a dictionary that maps all the words contained in the glove file to their vector representations. One small snag here is that one row has only 50 separate elements. As a result, the word corresponding to that row is a 49 dimensional vector. The next few steps are just to remove that row from the embeddings index dictionary. All set. Next step is to tokenize out data. Tokenizing will convert a sentence to an array of word indices, as described below. I'll work with a subset of the data to make the training a little faster. We need to set the values of a few constants. maxlen defines the max number of words in a sentence. max_features is used by Keras's Tokenizer to select that number of unique words from a set of words input to it. Now that the training data is tokenized, we can create an embedding matrix of shape (max_number_of_unique_words_we_tokenized_capped_by_some_upper_limit,embed_size). We'll use random initialization for words that aren't in GloVe. We'll use the same mean and stdev of embeddings the GloVe has when generating the random values. Simply put, each row of this matrix is the vector representation (from glove file) of a word in the word index. This embedding matrix can then be used as weights for an Embedding layer in a model. We can choose to update these weights during training or not. 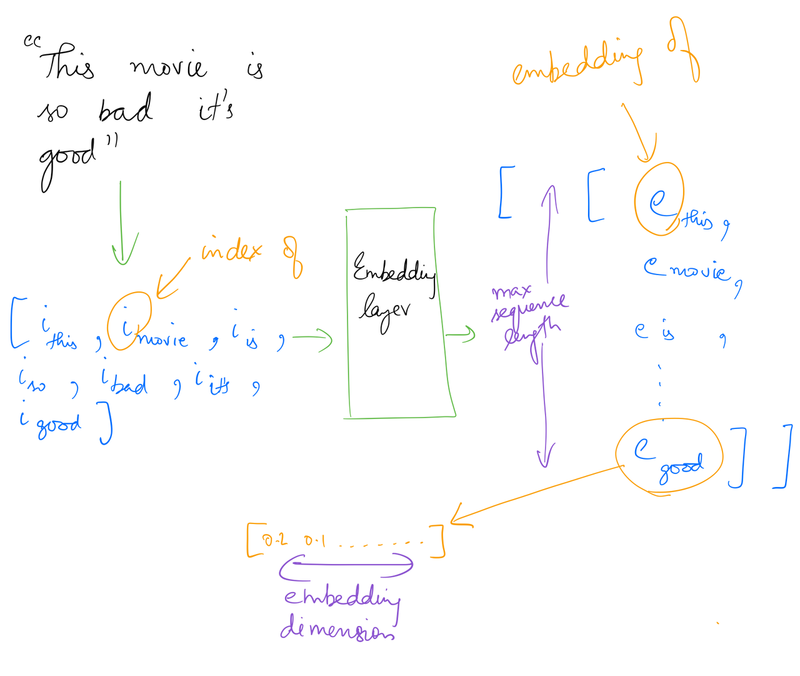 So when an input of shape (None, maxlen) is given to this Embedding layer, it will convert it to (None, maxlen, embed_size) as seen in the diagram below. Seems to have started overfitting after the 3rd epoch. A bunch of improvements can be done beyond this baseline, but my main motive behind this exercise was to understand how word embeddings and LSTMs work together.